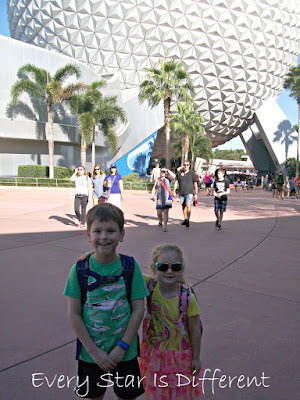 Our first day in the parks was spent at Epcot. 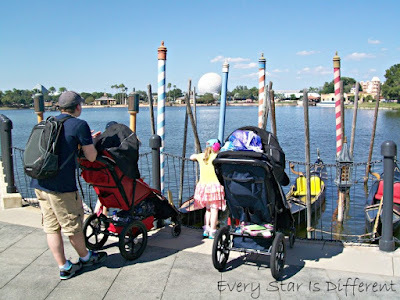 I've read so many reviews about kiddos not having fun at Epcot. We had the opposite experience. Our kiddos didn't want to leave! 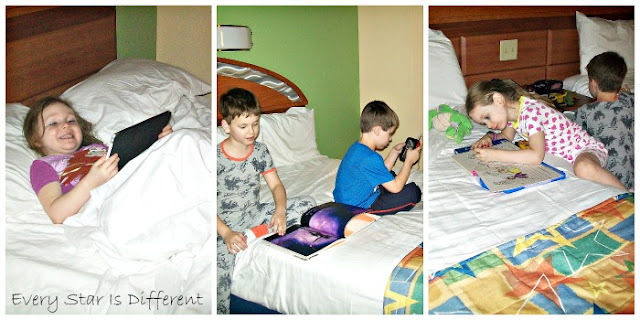 Originally we were going to wake up early and catch the first bus to Epcot, but the kiddos needed some extra sleep, so we arrived a little bit later than planned. The kiddos were so excited to be there! I had really been worried about how long it would take us to go through security and actually enter the park. To my surprise it was super fast. The only issue we ran into was that Jason's magic band wasn't working. We were sent to guest services, which was actually our next stop anyway, so it worked out well. That did take a while, but I had bubbles for the kiddos to use. That kept them occupied. Jason had his band supposedly fixed. We also set up our guest disability passes. Again, I thought this process would take a while but it was done in a matter of minutes with very few questions. 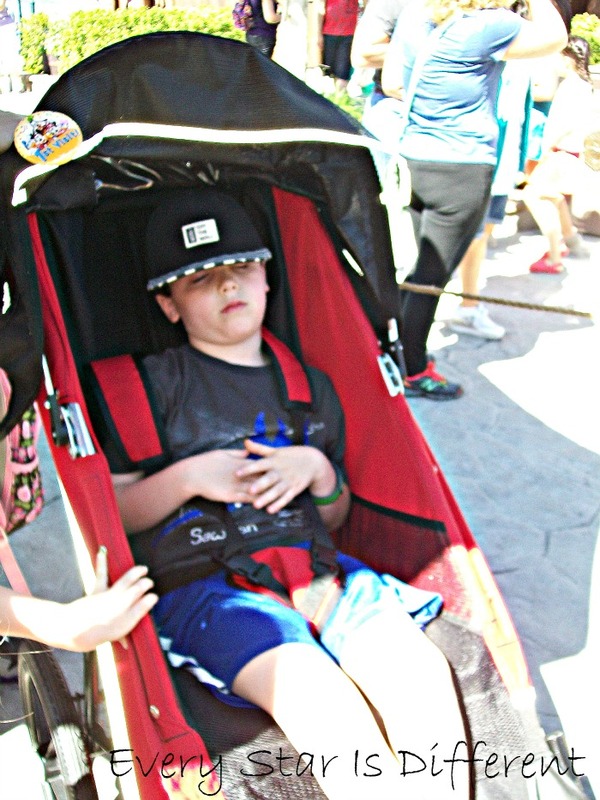 Both of our strollers were tagged as wheel chairs, giving us handicapped accessibility to every ride, show, and transportation option in the parks. 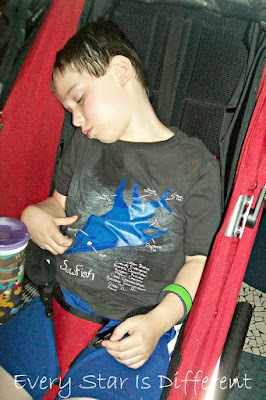 Sunshine's magic band was set up for the rest of the guest disability services that were offered. If I had the chance to set up the passes again, I would have used Bulldozer's band, just because there were times we had to take Sunshine back to the hotel. I'll just remember that for next time. Our plan for the day started at the Seabase. Dinomite and Bulldozer especially loved looking at all of the aquariums. But first we headed to the Finding Nemo ride. The boys rode with Jason. I took the girls. Thanks to our wheelchair tags, we were able to take the strollers all the way to the ride. We only had to take Sunshine out when it was time to transfer her to the ride. This helped us so much. The ride itself was okay. I couldn't believe how dark it was and there were definitely parts that were scary for Sunshine. She screamed a little, but did okay for the most part. 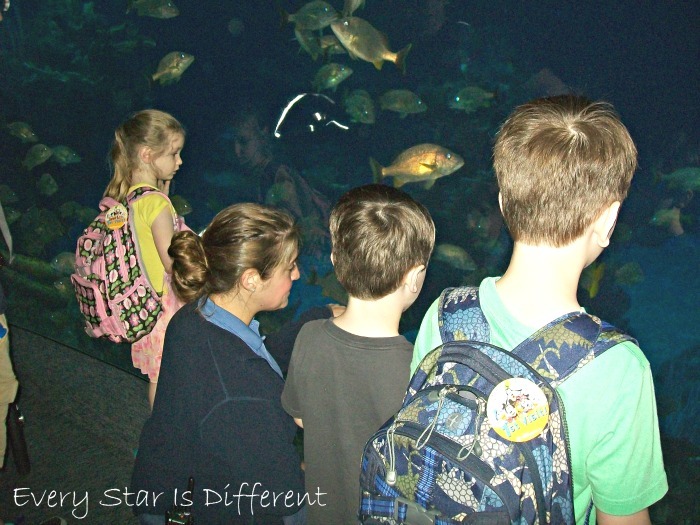 Once off the ride, we continued our tour of the aquariums. 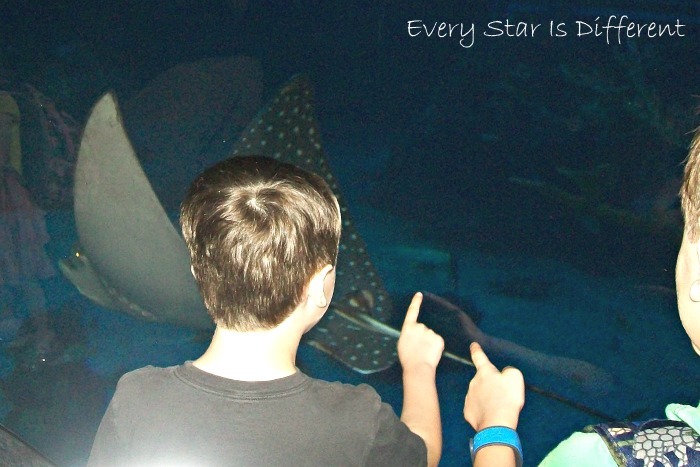 There were sharks, rays, sea turtles, dolphins, and so much more to see. Dinomite surprised a cast member with his knowledge of sea life as they discussed many of the sea creatures in the tanks. I always smile when he does this. It's so fun to see an adult's reaction to just how much Dinomite knows about his favorite subjects. 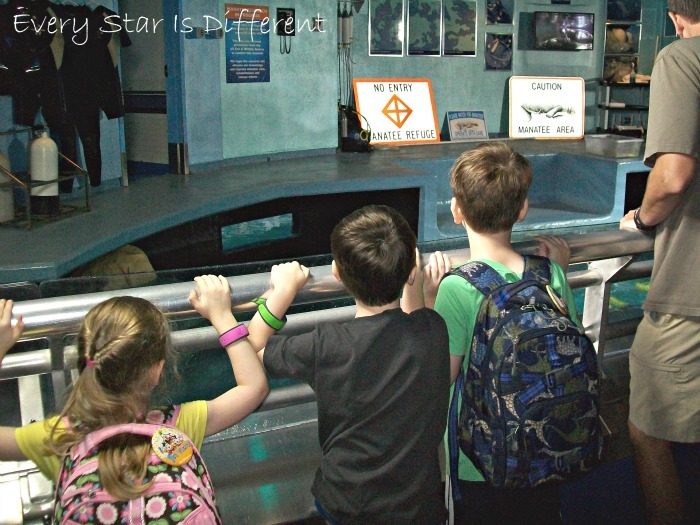 Our next fast pass was for the Turtle Talk with Crush show. Due to our wheelchair tags, were were taken to a back room and allowed to enter the show room before other guests. We sat in designated handicap seats. The older three kiddos were invited to sit up front with the other children. I admit, Jason and I were super nervous about this, as they would NOT let adults sit with them, but we decided to give it a go and, worst case scenario, Princess would most likely need to be removed from the front. To our delight, all of the kiddos did well during the show. Sunshine remained in her stroller and was entertained with our Finding Nemo themed busy bags. The hardest part for her and the other kiddos was waiting in the back room before it was time to go to the show. Thankfully, snacks held the kiddos over for the most part. The show itself was super cute and very funny for adults and kiddos alike. After Turtle Talk with Crush we continued on through the aquariums. There is so much to see! I was thrilled to introduce the kiddos to a real live manatee. Manatees are one of my most favorite animals. I remember going to Florida with my family as a little girl. We'd see manatees in the waters where we stayed. My grandparents would give us lettuce to feed them etc. It always saddened me so much to see the damage done to their bodies where they'd been hit by boats etc. The kiddos and Jason fell in love with manatees as well. 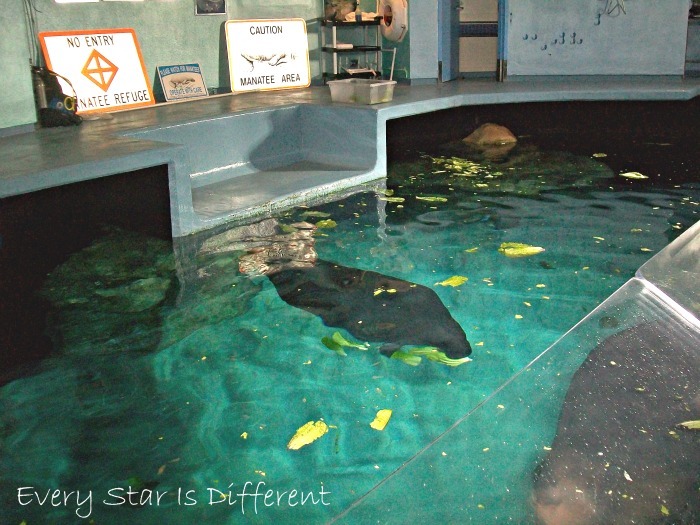 It was such a sweet experience for me, made all the more special as it just happened to be feeding time and the manatees were given tons of lettuce. Bulldozer and Dinomite especially loved watching them eat. Once finished at Seabase, we headed to the World Showcase to Norway, where we had reservations for lunch at Akershus Banquet Hall. It would be our first character dining meal, with five princesses to see and spend time with. Everyone was so hungry and exhausted by this time. Dinomite was melting down a little bit. Bulldozer fell asleep. Sunshine was trying to work through another transition after just finally becoming comfortable at the aquariums. It was a rough moment, but we made it through. Once in Akershus Banquet Hall, our first stop was a meet and greet with Belle from Beauty and the Beast. The girls were super excited. The boys wanted nothing to do with the princess. 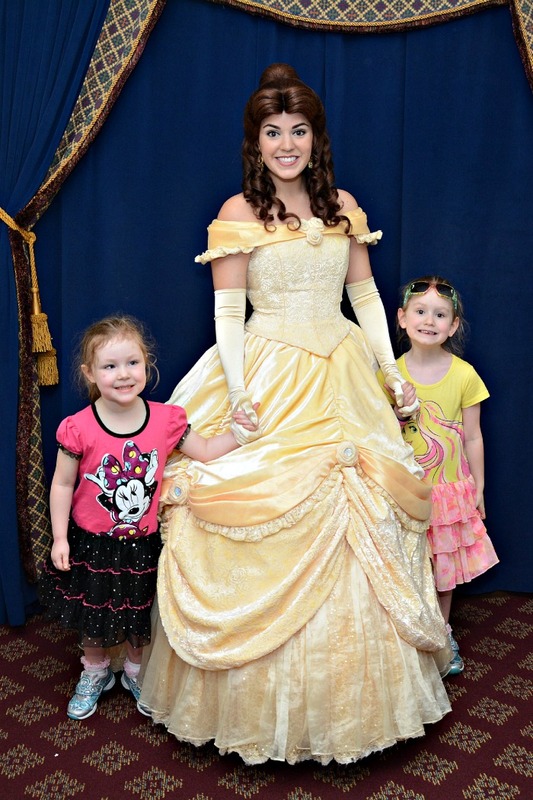 This was our very first princess experience, you can tell the girls are a little bit nervous in the picture. Eventually we talked the boys into joining a picture with us, but you can see they weren't at all thrilled. They were hungry, thirsty, and tired. The first matter of business once we were seated was meeting the chef. Due to Bulldozer and Sunshine's food allergies we were not permitted to order anything until we had met with a chef who then would give permission. I liked this a lot as it brought comfort knowing just how serious Disney World is about accommodating special dietary needs. 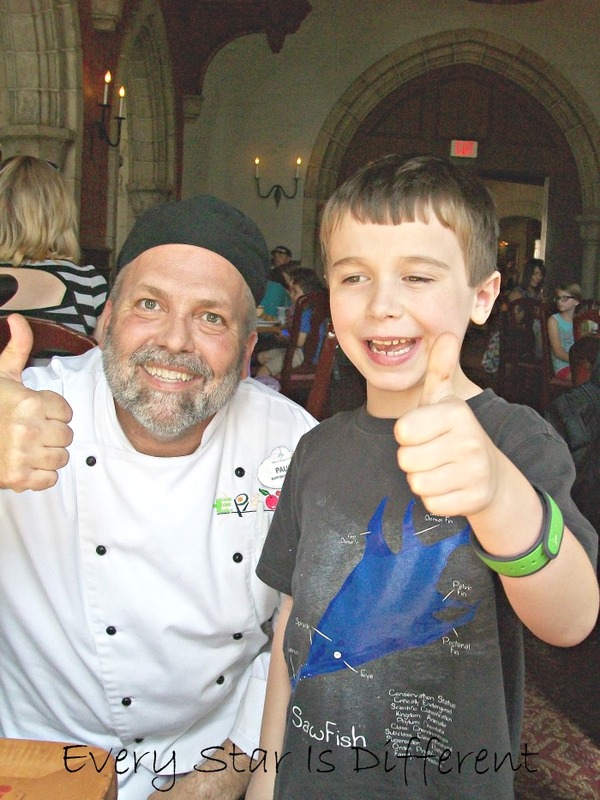 Bulldozer was super excited to meet a real chef and more than willing to pose for a picture. He was so cute! 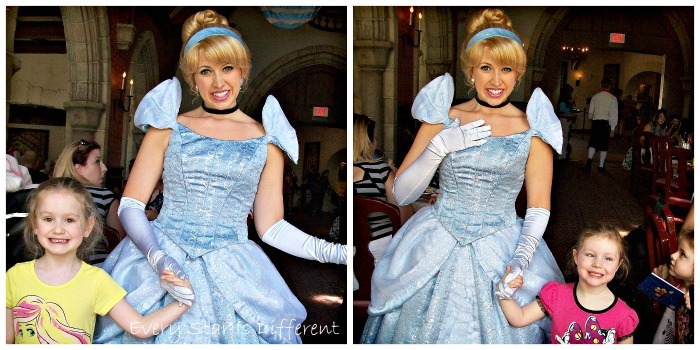 While we waited for our food, the princesses started arriving one by one to our table. 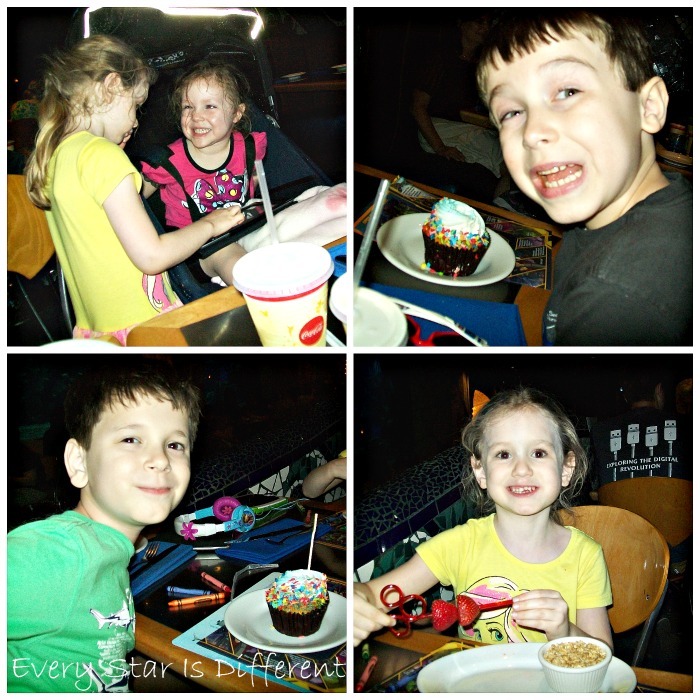 We had practiced eating out as a family for months and the kiddos had mastered the skill, however it seemed that everything they had learned and practiced went out the window during our first restaurant experience with characters. The room was loud. Princesses were coming and going. We were flipping through autograph books to have them signed. We were taking picture after picture. The kiddos were getting up and down and up and down. Jason and I felt like we were running a marathon. This being our first meal, we had both Sunshine and Bulldozer out of their strollers to eat. Sunshine would not stay in her seat. She was constantly climbing all over me. More than once we had to go for a walk to regroup. The food was AMAZING and so delicious. I only wish we could have enjoyed it more. 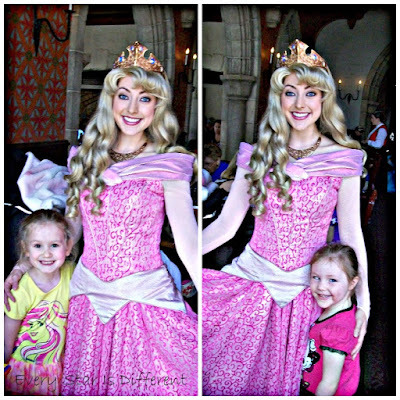 With that said, the girls really did enjoy the princesses. Cinderella was the first to arrive at our table. Once again, the boys wanted nothing to do with her, but the girls enjoyed her. As princesses go, Cinderella was not our favorite. She seemed a little too uptight to be the Cinderella we know and love from the animated Cinderella movie, but again, the girls loved her. Ariel from the The Little Mermaid was our next princess. She was by far our favorite, so into her character. Bulldozer loved her too and wanted a picture with her. 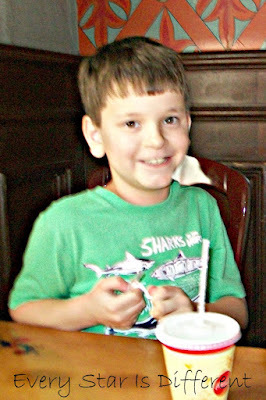 Dinomite was finally feeling better at this point and was showing smiles again. The girls were thrilled to meet Aurora from Sleeping Beauty. Princess was excited she was wearing pink. Out of all of the pictures from this lunch, these are my favorite. 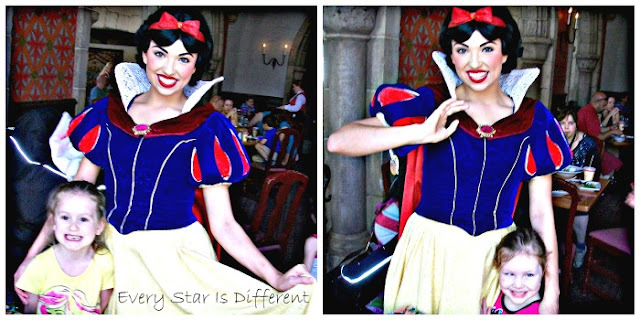 Snow White arrived after Aurora. She was amazing and had so much fun with the kiddos. Bulldozer especially loved her. 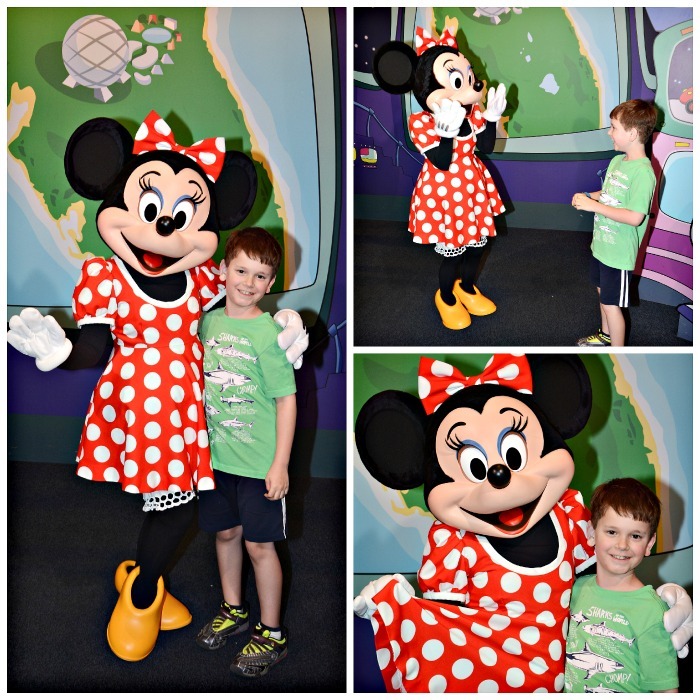 He was so smitten that he invited her to come to Mickey's Not-So-Scary Halloween Party with him. I was so disappointed once I looked at the pictures, to realize I hadn't taken one of him with her. Lunch was delicious! 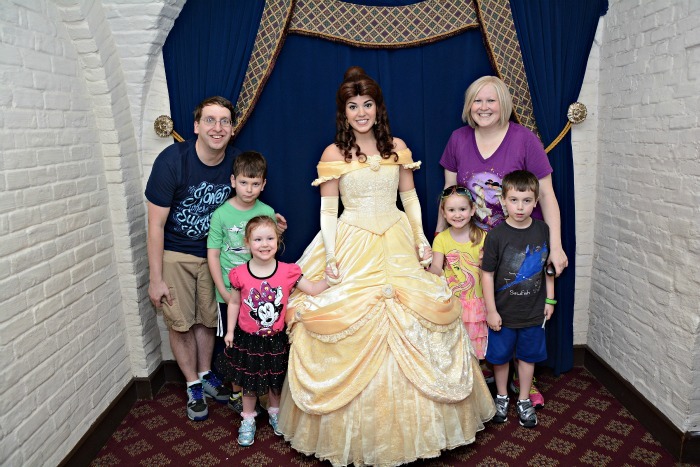 When we return to Disney World again, we will definitely come back here, just not when princesses are around. From beginning to end, our dining experience lasted two hours. Part of this was waiting for a table, but another aspect of it was meeting with the chef and having special meals prepared. This seemed to be the trend at all restaurants during our stay. 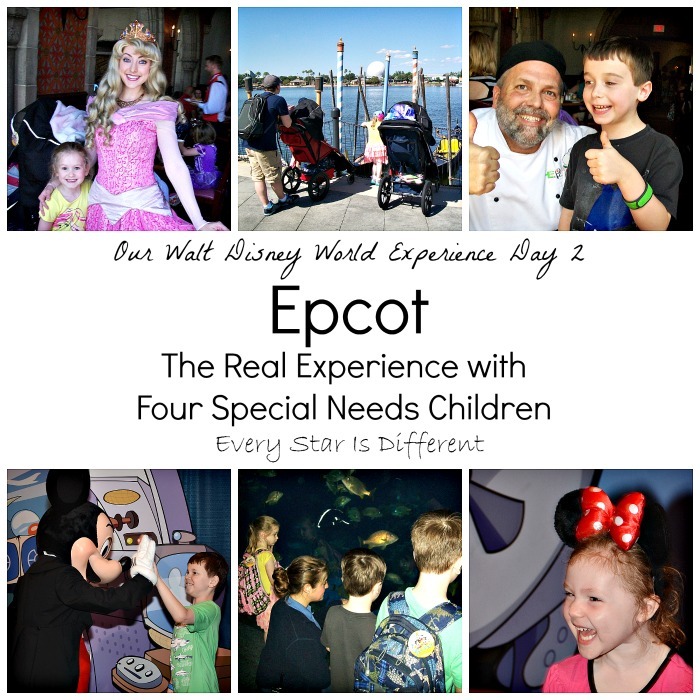 If you have special dietary needs, be sure to plan two hours for each dining experience. This was the only flaw in my daily planning for our trip. After lunch Dinomite wanted to go into the the little museums around the world. He had looked forward to this and wanted to be sure that we followed through on it. 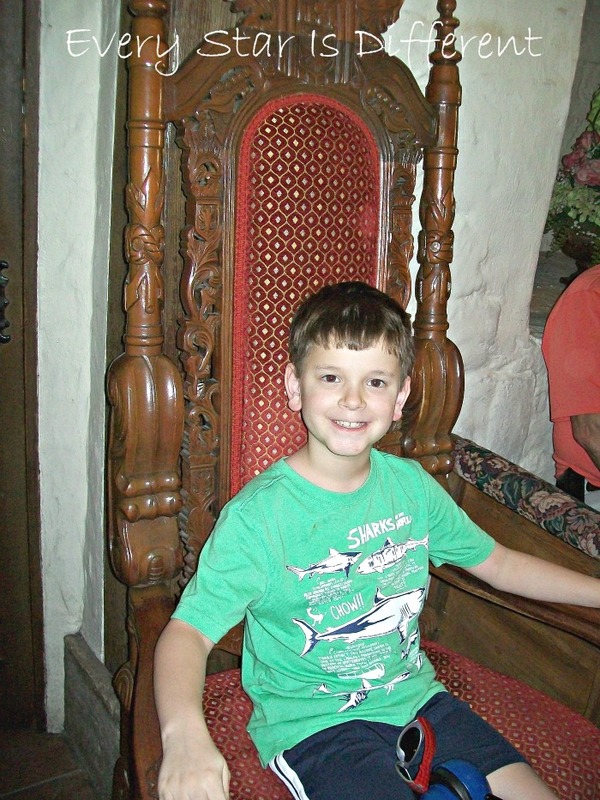 He loved sitting in a royal throne. 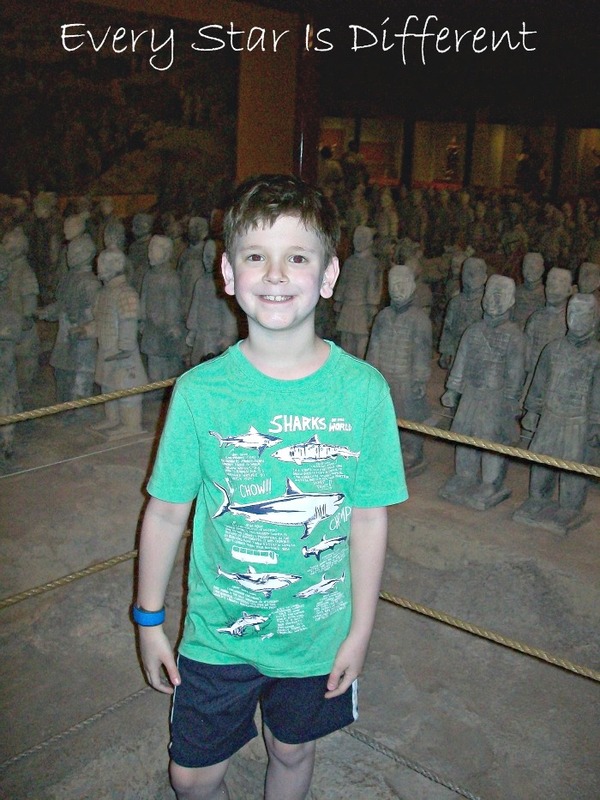 While in China Dinomite loved the House of the Whispering Willows. 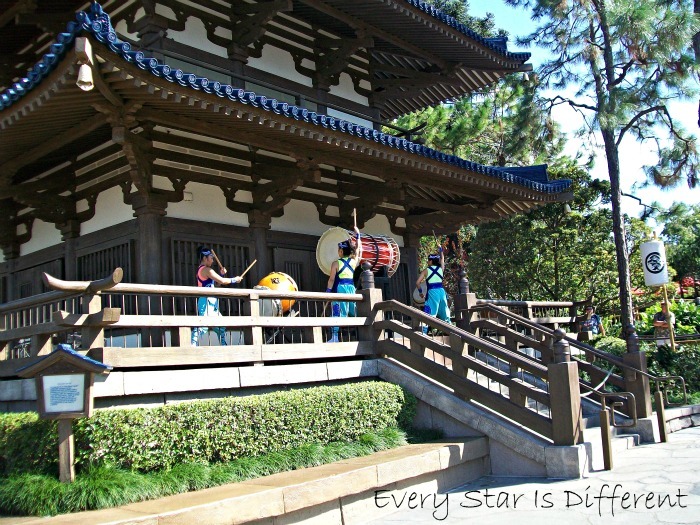 Our plan for the World Showcase was to simply walk through it, catching any princesses we may have missed during lunch, including Mulan and Jasmine, along with a few others. Because lunch had taken so long we didn't have as much time as what we thought we would have, but it all worked out. Sadly, Mulan was not in China when we were there. 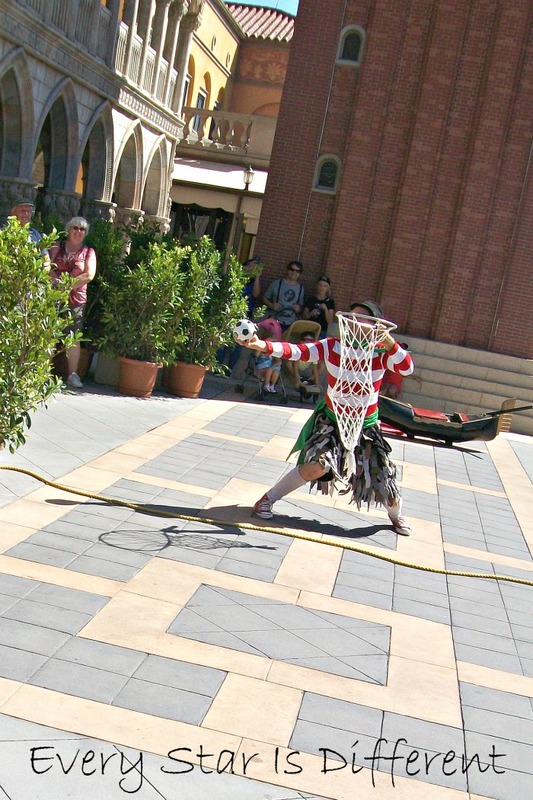 In Italy, we just happened to be in the right place at the right time to catch Sergio, the Italian Juggler. The kiddos loved watching this show. Princess was asked to participate. She had to throw the little ball into the fish net. She was beyond thrilled to be chosen. After the show we went to check out the gondolas. Our day in Epcot was very sunny and HOT. Keeping the kiddos hydrated and coated in sunblock was quite a challenge. As we arrived at the United States of America, an a capella group American Music Machine had just started performing. It gave us a chance to rest, have a snack, drink some water, and enjoy some great music. All of the kiddos loved the show! The group was fabulous. We weren't out of the sun by any means, but just to rest was nice. Jason went and purchased a funnel cake that he, Bulldozer, and I shared. This was the highlight of Bulldozer's break. He does not do well in heat at all, as you can see in the picture above. I was so thankful he had his stroller, because if he hadn't, I know we would have been carrying him through the park. As we arrived in Japan, we were able to catch another show Matsuriza. 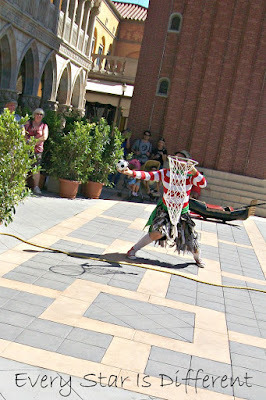 The entertainment in Epcot was amazing. I was so surprised the kiddos loved it so much. 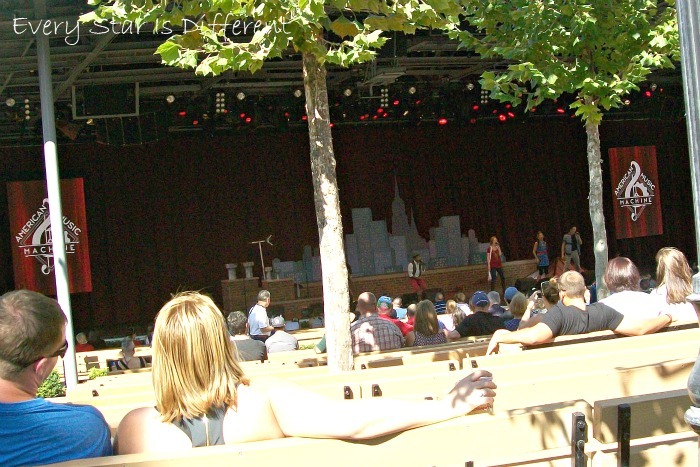 While at Epcot, I was so excited to see how much the kiddos enjoyed musical shows. It's so hard to know how much I have instilled in them as a musician, but while at Epcot it was so obvious, especially with Dinomite. 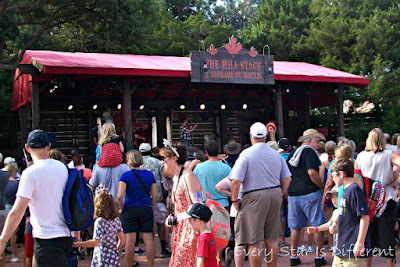 While in Canada, we happened to walk past the Canadian Lumberjack Show, just as it was starting. Though it was hard to see, we did stop and were quite entertained for a while. I was amazed we had made it through the entire World Showcase so quickly and in time for our dinner reservations. However, we hadn't been able to see any of the princesses that the kiddos wanted to see. Thankfully we knew we could catch Jasmine and Aladdin in Magic Kingdom. Mulan will just have to wait until our next trip. By the time we made it to our dinner reservation at Coral Reef Restaurant, Bulldozer was asleep again. I wish I could fall asleep anywhere, anytime, like he can. We did have a little wait before we were seated at our table but it was no longer than 10 minutes. The only difficult part about it was that the wait area was extremely loud. 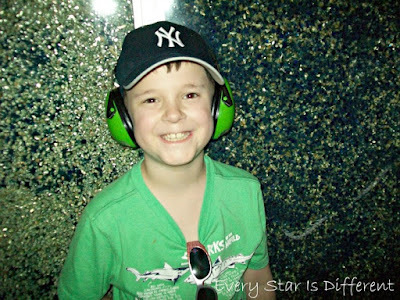 Once the kiddos had their Adjustable Headband Ear Defenders For Children, they did fine. 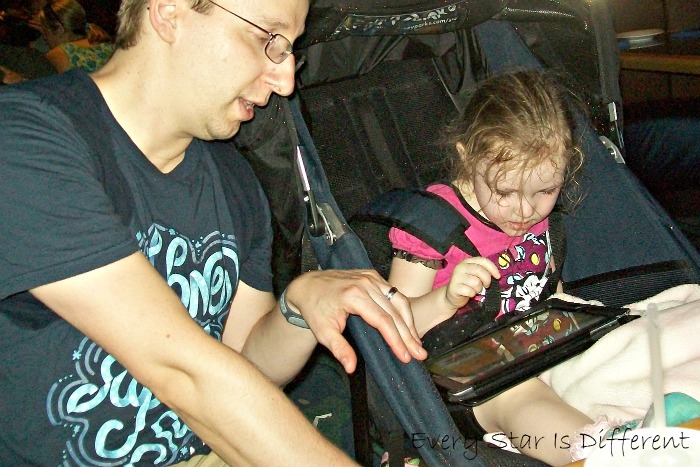 By this dining experience, we understood the importance of keeping Sunshine in her stroller throughout the meal. Bulldozer remained in his as well. The waiter just removed two chairs from the table and voila! For the first time all day, Jason took over with Sunshine, leaving me to have a much needed break after two days of Sunshine duty 100% of the time. Once again, the dining experience took two hours, but it was so enjoyable. The kiddos loved this restaurant. The food was divine. Everyone had a fabulous time. 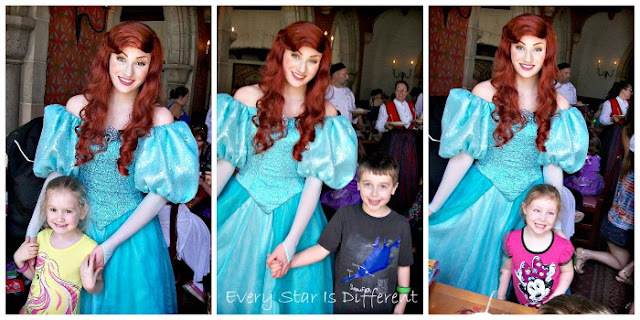 When we came home and asked the kiddos which was their favorite dining experience, all of them said this one, except Princess, who loved lunch at Akershus. Besides the food, the highlight of this meal was watching Dinomite eat a cupcake with sprinkles. He usually avoids any treat with sprinkles. After dinner we decided to split up. It was later than we had anticipated. Four hours of dining had really cut into our time. The meals were worth it, I assure you, but it was getting late. Bulldozer and Princess wanted to go on the ride Soarin' which was our last scheduled fast pass for the day. Jason took those two to have fun. Soarin' ended up being Bulldozer's favorite part of the day. We knew Sunshine wouldn't do well on the ride. Dinomite didn't want to go on the ride. 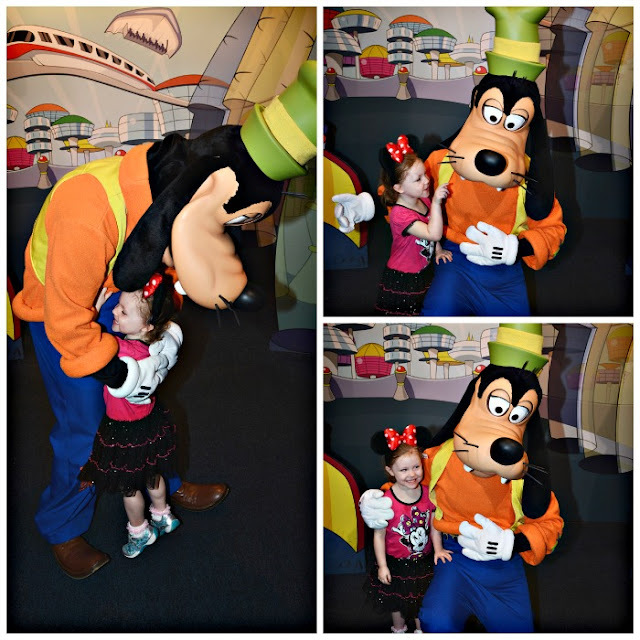 I took them to go meet Mickey, Minnie, and Goofy. We had plans to meet Mickey later in the week, but Sunshine wanted to meet Minnie, and this would be our only chance to do so. 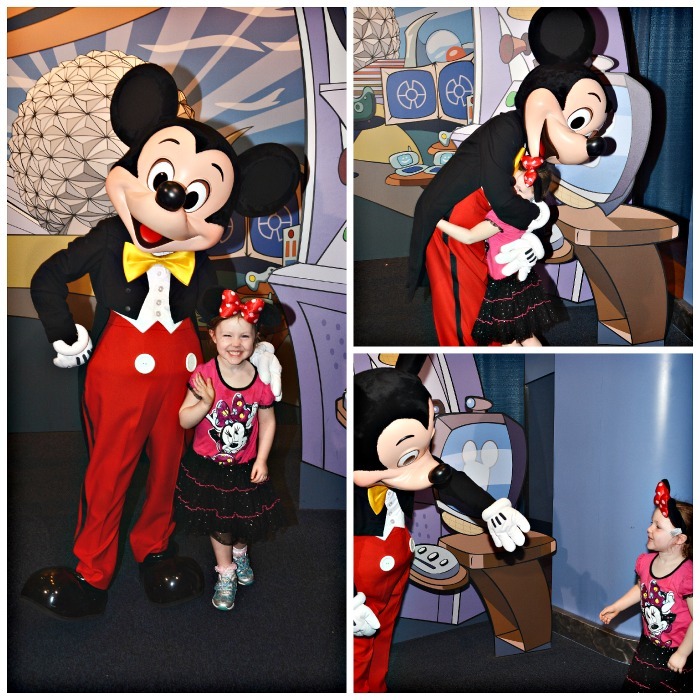 Sunshine had even been sure to have Minnie Mouse Ears for the occasion. From the moment we arrived in the park that morning she had requested them. Lol. Using our guest disability pass, Sunshine, Dinomite and I scheduled a time to return to the fast pass line to meet the characters. 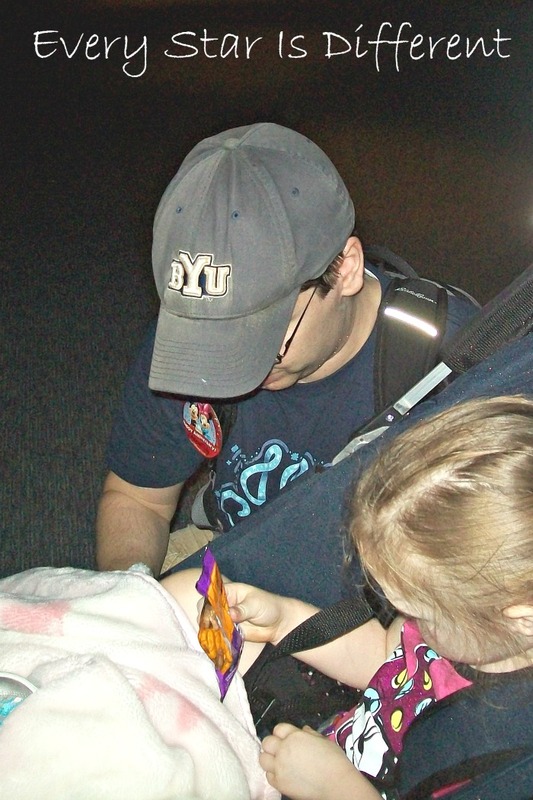 It was about a 30 minute wait, but it was 30 minutes out of line where Sunshine could run around, have her diaper changed, etc. I am so thankful for guest disability passes. Once in the fast pass line we still had to wait, but, not nearly as long. The most surprising aspect about our trip was how much Dinomite enjoyed the characters that don't talk. He LOVED meeting Mickey, Minnie, and Goofy, as you can clearly tell from the pictures. Watching Sunshine meet her favorite characters was the most precious moment of our trip in regards to her experience there. You can just tell by her facial expressions in these pictures that she is in heaven. The photographer took so many pictures as we were greeting the characters. All of them turned out so well. I just love the look on Sunshine's face as Mickey is signing her autograph book, the Junior Encyclopedia of Animated Characters . 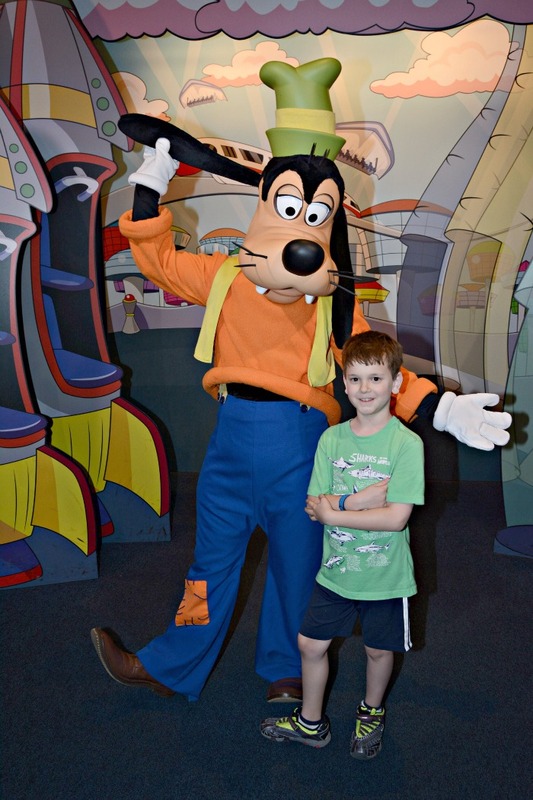 Next in the line of characters was Goofy. I couldn't get over how tall he was. There were many toddlers who cried and screamed as their parents tried to get them to meet Goofy, as well as the other characters. Sunshine didn't hesitate one bit. She wanted to explore every aspect of him. Lol. 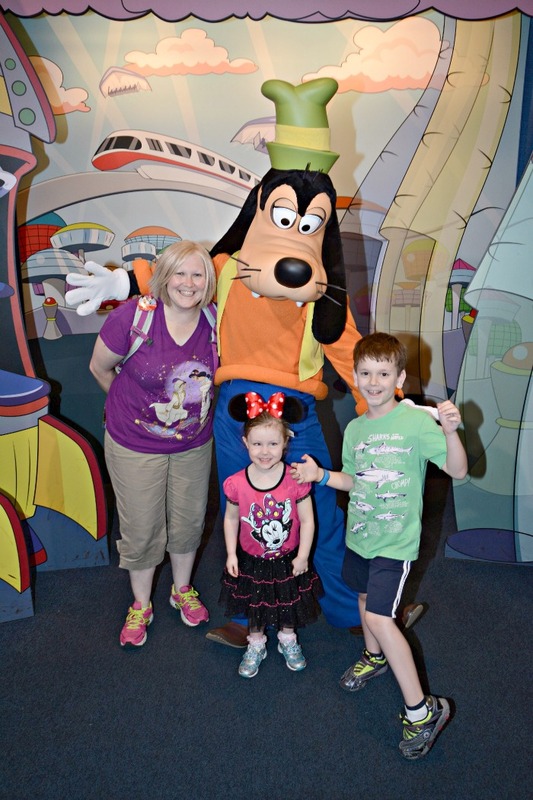 I'll admit, taking pictures with the kiddos and characters was a bit awkward for me, but I did it. I never knew how to pose, especially with my back pack on etc. Minnie was by far Dinomite and Sunshine's favorite character to meet and greet. Minnie saw Dinomite's shark shirt and jumped back with her hands up. Dinomite laughed. Sunshine was in love and just would not stay still. 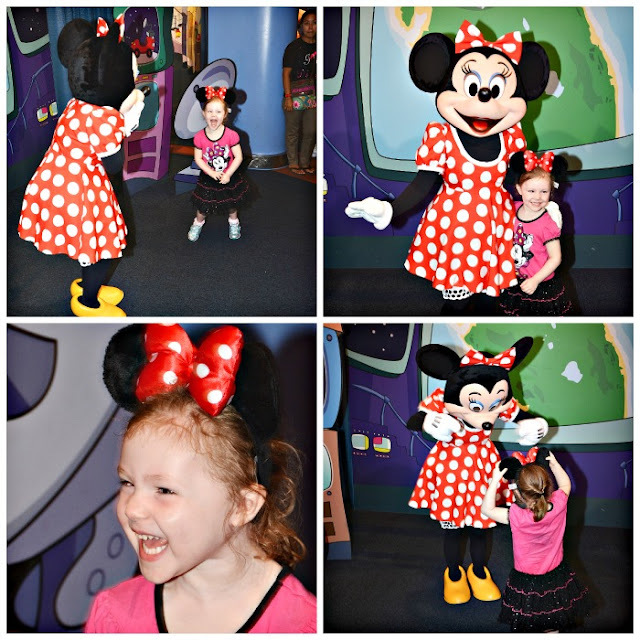 She danced with Minnie, twirling together as they went. They compared Minnie ears. It was such a magical moment. I am so thankful that the photographer was able to capture it so well. One day in Epcot was not enough. Had I known, I would have definitely planned to be there another day of our trip. There was so much that the kiddos didn't get to do, especially in regards to rides and characters. We definitely left wanting more, but knew the kiddos needed some sleep. Unfortunately, sleep was the last thing on their minds. None of them settled down and fell asleep until after 10 PM. Sigh. They loved their hotel rooms! When the kiddos finally went to sleep, Jason and I were able to unwind and discuss how the day went. We had a few hiccups between us, but by the end of the night we were able to sort things out and make plans for the next day. I packed up the kiddos' bags for our next adventure and we finally made it to sleep about 12:30 AM. 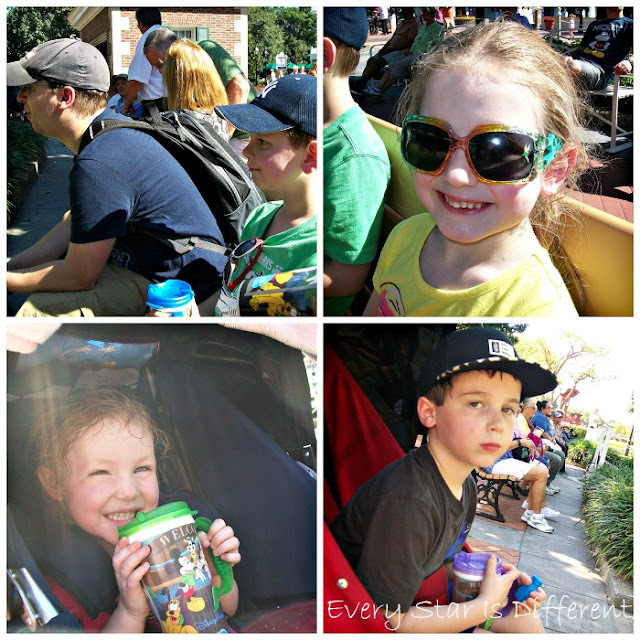 Though the day felt crazy and chaotic while we were experiencing it, when I looked back on all that we did, how well the kiddos behaved, and the memories made, I realized we had a fantastic day. I'm so thankful for all of the pictures I have to remember it by. 1. Upon entrance into the park, visit Guest Services to obtain disability passes for your family. If you have more than one special need children, set up services for the child that will spend the most time in the parks. 2. Request that your special needs child's stroller be tagged as a wheelchair. This sticker is like a golden ticket when it comes to special needs and helps in so many situations. 3. Set up fast passes in advance for rides that tend to have the longest waits. If your special needs children tend not to go for the popular rides, fast passes can also be used for some shows and character greetings. 4. Be prepared with activities and snacks to keep your special needs child occupied while waiting for rides, shows, and exhibits. Even with fast passes, disability passes, and strollers tagged as wheel chairs, you will still wait for most things. 5. If you have a child with special dietary needs, be prepared to add an extra 20 minutes to your wait time at table meals before food arrives. Until the chef meets with you, no orders will be taken. In total, plan two hours for each dining experience. 6. 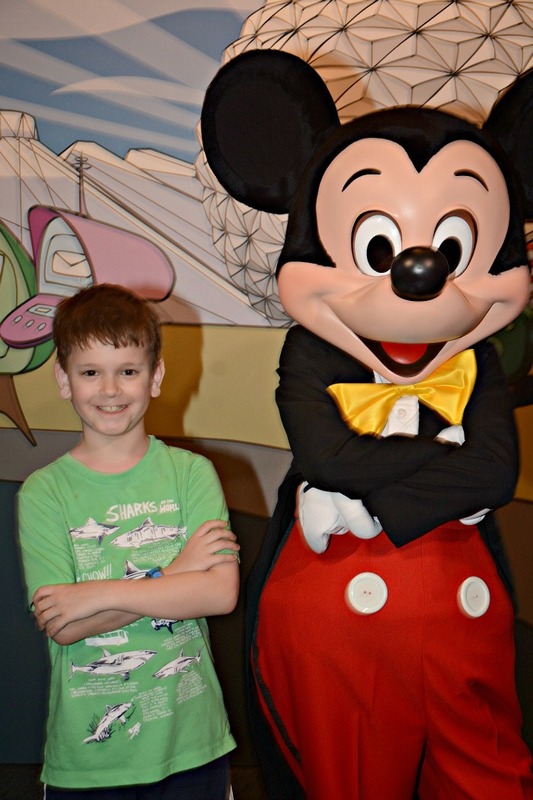 Restaurants at Disney World are LOUD, crowded, and chaotic, especially when there are character greetings. 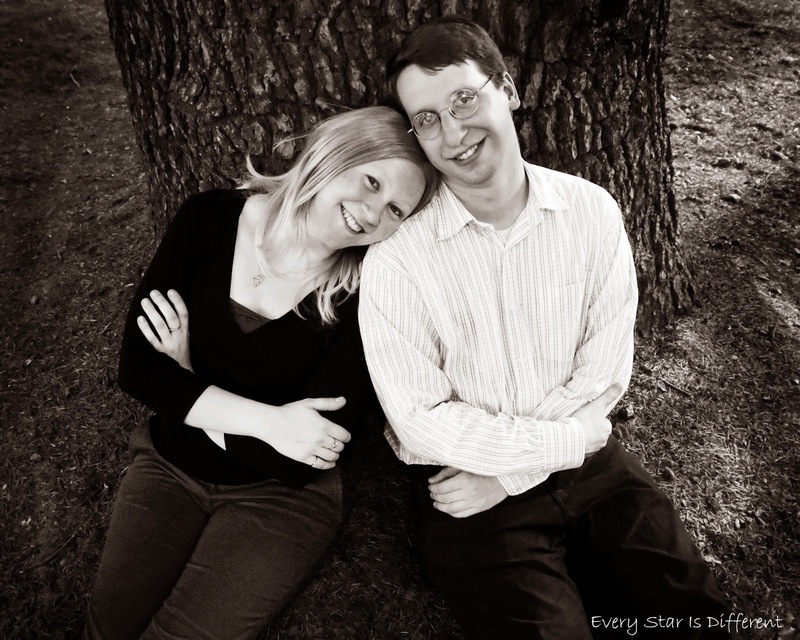 Bring items necessary to help your children with sensory needs. 7. Set up a plan for how you will handle character greetings, before characters arrive at your table. 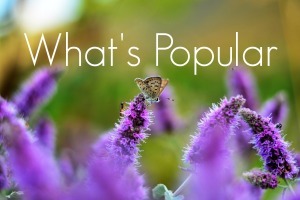 If you have more than one child, will each child meet and greet the character separately, or in a group, or both? Who will go first, second, third, etc.? Will autograph books be signed first or last, all together or separately? Planning all of this in advance will save you from dealing with so much chaos in the moment, when a character does arrive at your table. 8. 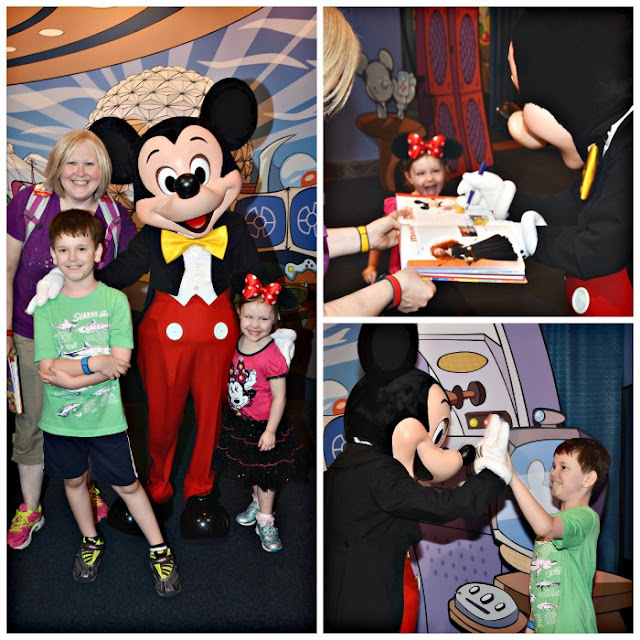 The easiest and quickest ways to meet characters in the parks are through table meal character greetings and fast passes if available. Otherwise you could be waiting in line for a very long time. 9. If you have your stroller tagged as a wheelchair, you have the option of bringing it to your table. Otherwise, all strollers are kept outside. 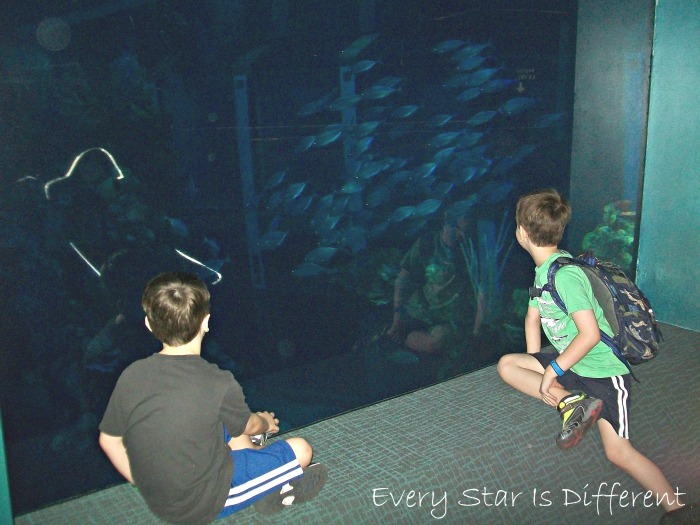 We HIGHLY recommend this with special needs kiddos. Just be sure when making your reservations ahead of time that you note that you will have a wheelchair with you. 10. If you're planning to partake in all that Epcot has to offer, be sure to plan two full days in the park. It is impossible to do everything in one day. 11. Take the time to enjoy the shows Epcot has to offer. They are very kid friendly and so enjoyable. 12. 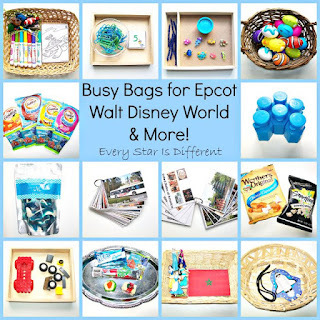 Plan for unwinding time after returning from the parks, especially if your kiddos are sensitive to sensory input. 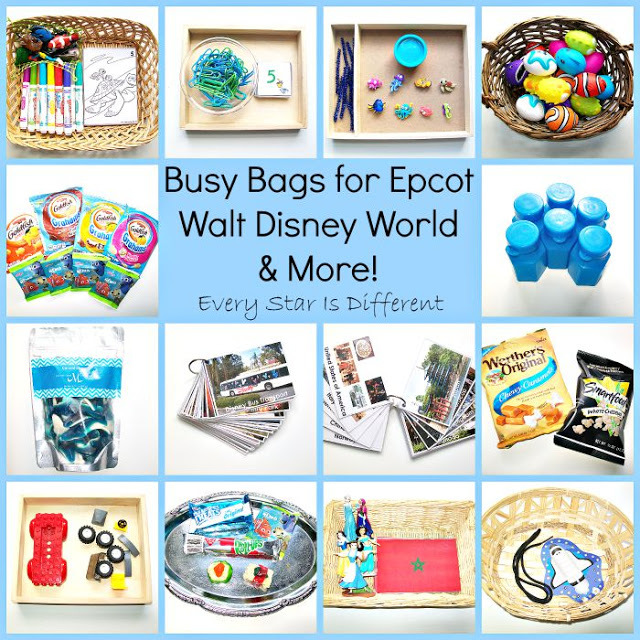 For those interested in our busy bags used while at Epcot, check out the post below! WOW!!!! Sounds like truly magic experience!! You all looks so happy! Thank you for sharing this with us!! You are such an honest and beautiful person! It always shows in your posts!